This 53-foot trailer is carrying The Wall That Heals exhibit that is a model re-creation of the Vietnam Memorial in Washington D.C. The exhibit also has an education center. Made of solid surface material and at 75 percent scale of the wall in Washington, D.C., the replica is now the largest in existence, according to the company. The wall exhibit is now touring the country. 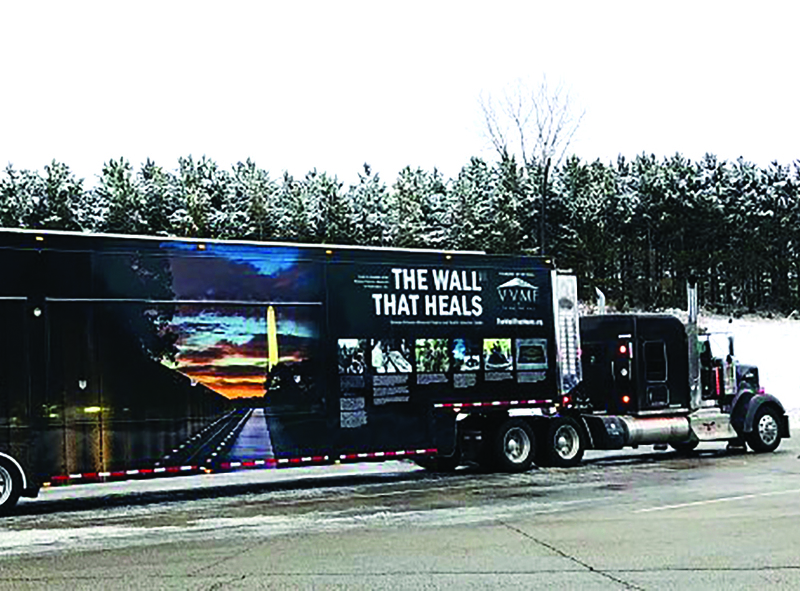 A program of the Vietnam Veterans Memorial Fund (VVMF), The Wall That Heals tours the country from coast-to-coast via a 53-foot trailer that also serves as a mobile Education Center. Visitors will be able to further engage with The Wall That Heals by viewing artifacts, memorabilia left at the memorial wall in D.C. and photos of fallen service members. In the mobile education center exhibit, visitors can see “hometown heroes” on the first screen, a photo display of service members whose names are on the wall that list their home of record within the area of a tour visit. On the second screen, visitors can view the “In Memory Honor Roll,” which includes photos of Vietnam veterans from the state of the current tour stop who died as a result of their service in Vietnam after the war ended. The Wall That Heals left Creatacor’s headquarters in Clifton Park on Feb. 23 with a ceremonial sendoff by veterans from all U.S armed services. Its first stop was Portland, Texas, on March 1, followed by 40 additional stops across the country. For additional information on The Wall That Heals, or to view the schedule, please visit thewallthatheals.org. Celebrating 30 years in business, Creatacor, Inc. offers a full complement of exhibit design, fabrication and management services to trade show exhibitors and event marketers. Creatacor’s wide scope of products include custom exhibits and displays, mobile tours, marketing events, stage sets, museums, and complete trade show program management. The Vietnam Veterans Memorial Fund (VVMF) is the nonprofit organization that built the Vietnam Veterans Memorial in Washington, D.C. in 1982. VVMF is dedicated to honoring and preserving the legacy of service in America and educating all generations about the impact of the Vietnam War and era through programs, ceremonies and education materials.